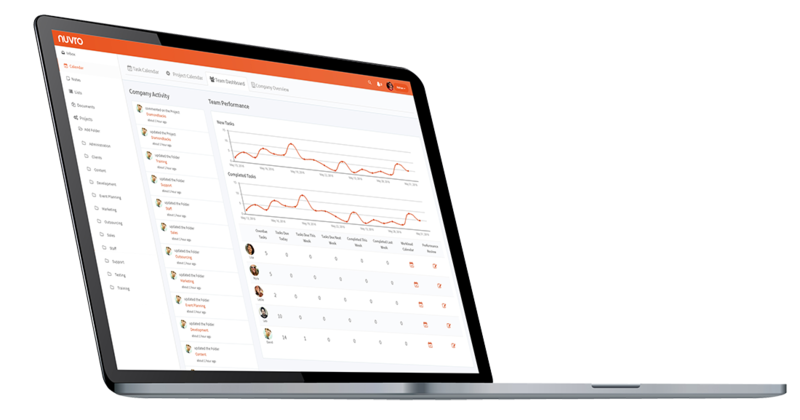 If you haven’t made your mind up about a project management tool yet then we suggest trying Nuvro, a service that is positioned as something between Asana and Wrike. What is interesting about Nuvro is that it was made by Adrian DeGus for his own needs and then, when it was found to be very handy, it was turned into a commercial product. Being an owner of a digital marketing agency, Adrian was looking for a robust online project management tool and services like Trello, Asana, Wrike or Podio were either too insufficient to too overwhelmed and expensive. So if you face the same dilemma look at Nuvro and probably it will fit your needs. 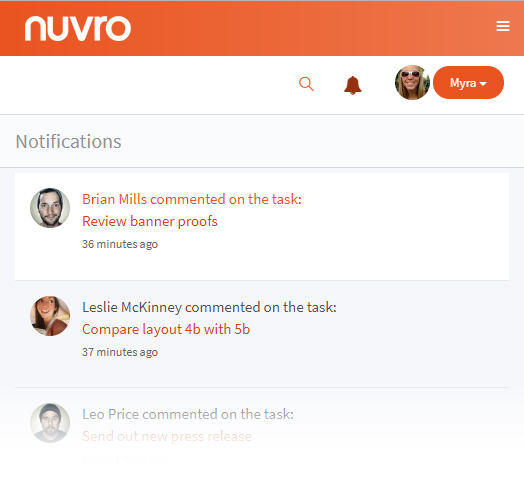 In this review, I’ll cover Nuvro’s major features with screenshots so that you could save your time in getting an idea about this service. 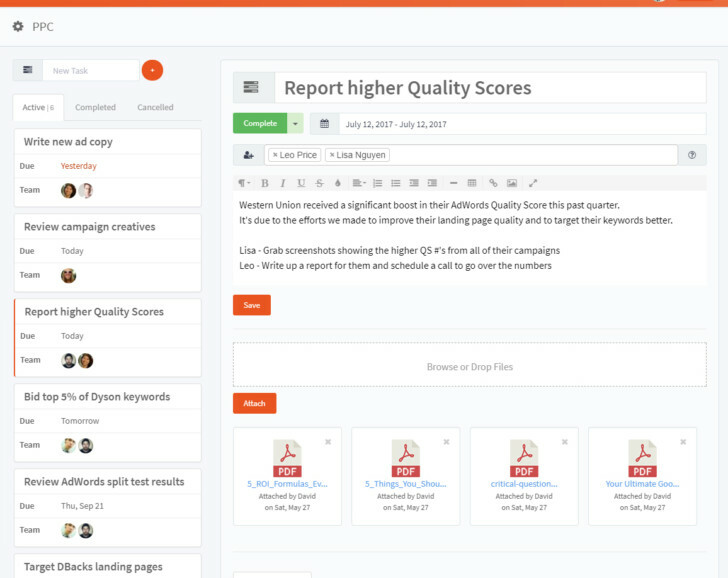 This format gives you a birds-eye-view of what’s going on in your company and can be extremely useful if you have to manage several people doing dozens of tasks. You can immediately see what tasks (or projects) should be done today, this week or the next week and how many of them are already overdue. Also, this page shows who is assigned to each task and what project a task belongs to. As most of other project management systems, Nuvro operates in terms of projects consisting of tasks. 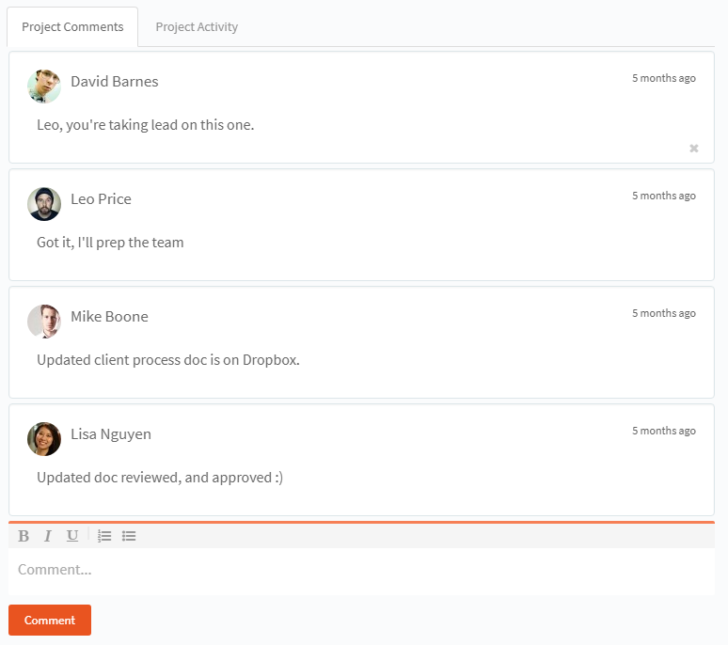 As you saw in the previous section you can overview your team load either in terms of tasks or in terms of projects. As both interfaces for editing tasks and projects are very similar in Nuvro, here we will consider only the one related to task management. 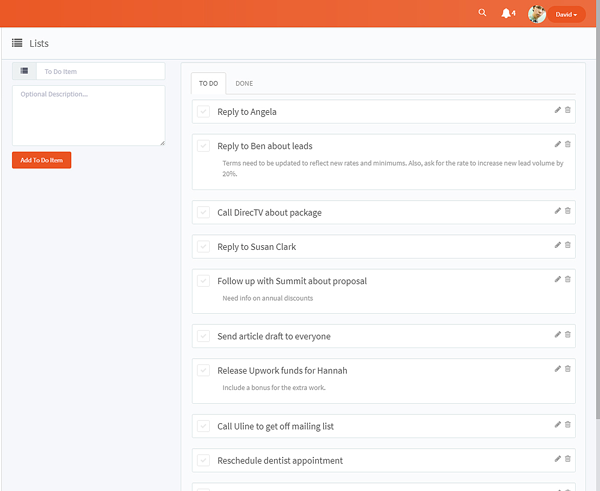 From the screenshot above you can see a list of tasks in the left pane divided to Active, Completed and Cancelled tasks sections. You can select task details on the right or create a new task by clicking a “plus” button on top of the task list. Each task can be assigned to several people at once and all people assigned to a task will see it in their calendars (dashboards). It’s not clear, though, whether it’s just a list of people involved with this task or all of them are altogether responsible for accomplishing it. A task can be in one of the following states: Active, Completed, Cancelled and Deleted. You can manage these states from a green drop-down under the task’s name. There also you can set up the period during which the task should be completed or specify a single date as a deadline for it. This date will determine task’s position in assignee’s dashboards. 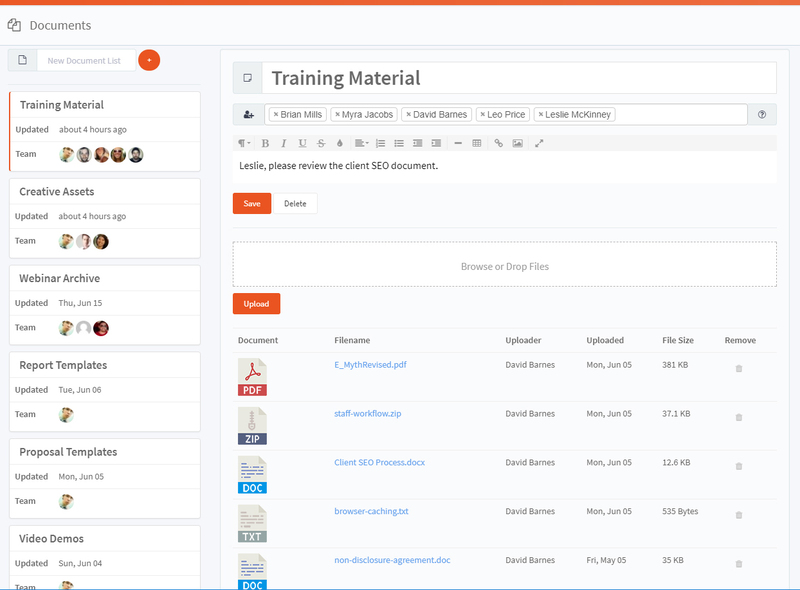 As a part of the collaboration process, Nuvro allows sharing documents vital for your projects. Common documents are grouped by categories and can be shared with specific team members, your entire company, or you can choose to keep them private. This makes it possible to keep all project information in one place. So just like the commenting feature in Nuvro should substitute using emails in your projects, this feature is intended to eliminate using Dropbox or Google Drive from the workflow. But that’s not all. 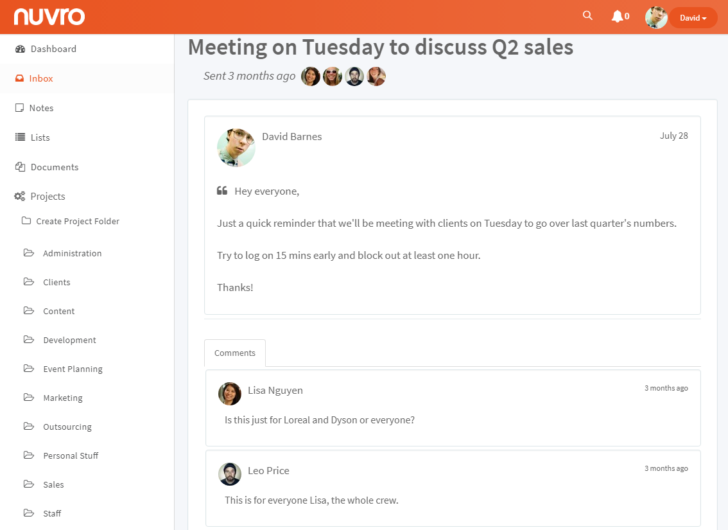 In the same manner, Nuvro tries to put Evernote, OneNote, and Simplenote out of a job providing you the note sharing feature. In the “Notes” section you can jot down your thoughts, ideas, lists, and drafts and choose to share some with colleagues while keeping others private. Nuvro also supports a simple implementation of TODO list. You can quickly add several things to be done and control how it’s going not leaving the app. These todo-items are private, you can’t share them with others, but it’s not a problem since you have tasks that are specially designed for this purpose. The only thing I’d like to have here is a number of uncompleted tasks somewhere in a prominent place forcing me to aspire to zero it. At the moment of writing this article, Nuvro had a simple pricing: $25 for teams up to 10. It’s cheaper than other paid project managing services, but there is no free plan and obviously, this pricing is more comfortable for bigger teams than for teams of 2-3 members. As a project management tool, Nuvro is intended to replace all collaboration tools needed to make your project running. 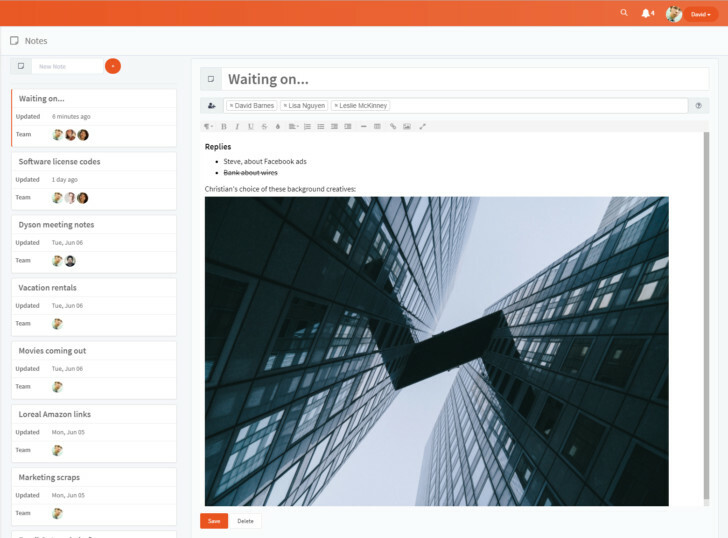 So instead of sharing files via Dropbox, keeping to-do lists in Todoist, managing projects in Trello and even discussing the project via email, you can do it all in Nuvro. As for me, it has a nice web2.0-like interface, adaptable for various screen sizes so one can comfortably work with it on your desktop as well as on your smartphone. The only thing bothered me is slow page swapping and significant flickering on each page reload (so I’d suggest the developers take advantage of the AJAX technology there). 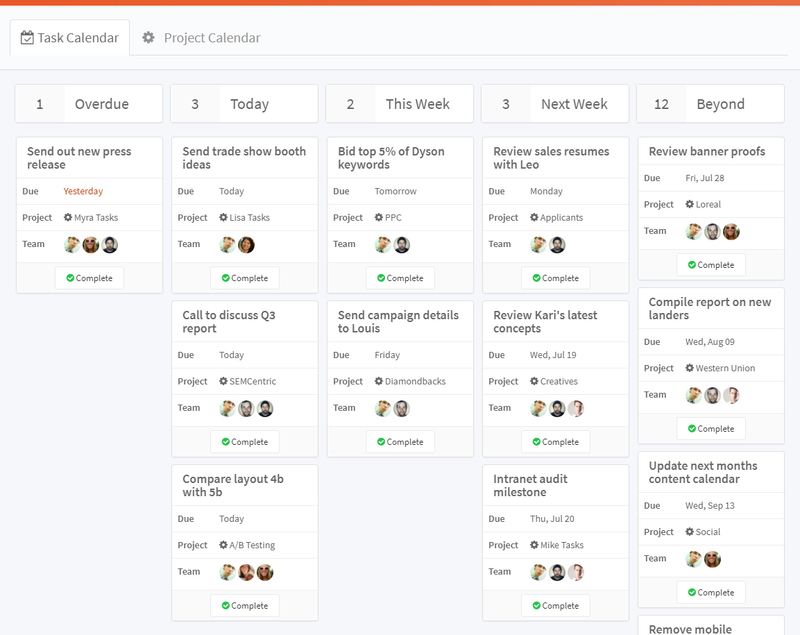 In general, it’s a good alternative to complicated project management services like Wrike and Podio. It’s very intuitive and easy-to-learn. Try it and maybe you will love it.